​Pastor Dave Keck was born on June 7, 1965. He grew up in Kannapolis graduating from A.L. Brown High School in in 1983. He graduated from Lenoir-Rhyne University in 1987 with a degree in Business Administration. He worked as an Admissions Counselor for several years for Lenoir-Rhyne and then for the University of South Carolina before entering Lutheran Theological Southern Seminary in Columbia. During seminary he spent his internship at Our Savior Lutheran Church, Vero Beach, Florida. He received his Masters of Divinity from LTSS in 1996. 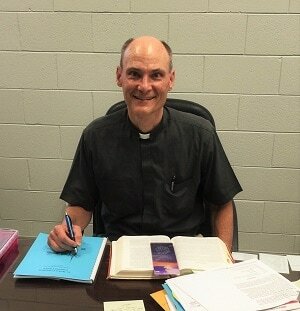 He was ordained at St. John's Lutheran Church in Salisbury on August 15, 1996 and served as an Associate Pastor at Good Shepherd Lutheran Church in Raleigh from July 1996 to May 2001, at which time he became the Pastor at Mt. Olive Lutheran Church in Hickory where he served for 15 years. He began his ministry at St. Mark's in Mooresville on May 15, 2016. Pastor Dave is married to Nina Keck. Nina is a Physical Therapist employed by Autumn Care in Statesville. They have two children, daughter Rachel, and son Robert. Pastor Dave comes from a lineage of Lutheran pastors. His father, Dr. David Keck, Sr. is a retired pastor living in the Cherry Grove community in Mooresville. His grandfather, Dr. Albert Keck (deceased) retired from St. Andrews Lutheran Church, known as the College Church adjacent to Lenoir-Rhyne in Hickory. Pastor Dave has been active within the North Carolina Synod and wider ELCA church by serving as dean of the Western Catawba Conference, as a voting member of the ELCA church wide assembly, and on the Lutheran Services Board of Advisors. He co-chaired the Lutheran Service for the Aging capital campaign Congregational Gifts committee and served on the Lenoir-Rhyne University Board of Trustees as well as other university committees. He also helped to coordinate synod senior high school youth retreats and served as a pastor/leader for Teens Encounter Christ. He has served the Hickory community as a YMCA soccer coach, a board member of the Greater Hickory Cooperative Christian Ministry, an adjunct professor of religion at Lenoir-Rhyne University, and a member of the "Rev it Up" musical group comprised entirely of Lutheran church pastors. He was the lone Lutheran recipient of the Wake Forest School of Divinity Holy Land Ecumenical Grant Project which included 20 North Carolina pastors from 14 different denominations and culminated in a trip to the Holy Land. Pastor Dave enjoys running, reading and recycling, along with worship and teaching. He is a talented musician and dramatist and has used his gifts to connect people to God through song, story and drama.